for the mana base having a land that comes in tapped is really bad and you cant look for it, so if it on budget i suggest you change it for Underground River , Sunken Hollow or Drowned Catacomb . Languish on the side or main will help with more aggro match ups, hopefully when you dont have creatures on the field. for now i cant think of anything else so good luck. Alternatief 4x Dire Fleet Poisoner kan ook beide doen 2om 2 en gaan spelen en checken welke beter past. Both Dire Fleet Captain and Captain Lannery Storm are solid Pirates. Storm is probably the better of the two as she smoothes out the mana curve and is a hasty topdeck (not to mention she can hit harder when you use Treasure). I’m just not sure where she goes in here. 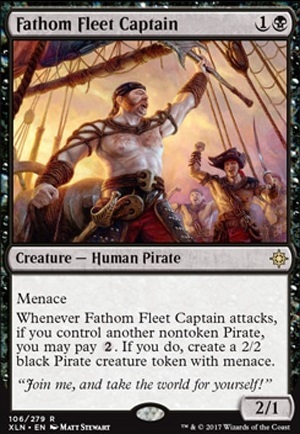 Fathom Fleet Captain is far too important a card for us to cut — it is one of our “must answer” threats and it can just run away with the game on its own (not to mention its powerful synergy with Dire Fleet Poisoner — if it gets double blocked we can two-for-one the opponent). 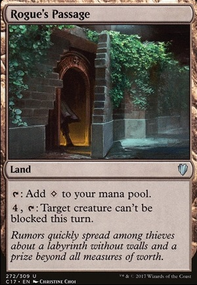 Also, extra three-drops are a little awkward for our mana base, since we’re on a 21-land plan. Still, I know this card is strong and I’ve wrestled with including it for the entire time I’ve brewed and played this list. 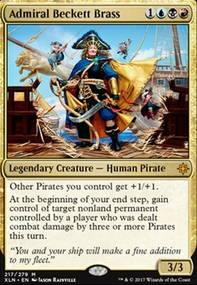 As for Dire Fleet Captain, it looks great on paper. If we play it on-curve, it’s an attacking 3/3 on Turn 3, which is great (and has the potential to get stronger as the game goes on, assuming we swing out). Post-wipe, though, it’s a weak topdeck, and it doesn’t have any form of evasion. It doesn’t interact at all either. There are also many situations in which it simply doesn’t get big enough to do the job. In practice, it has been really underwhelming, and I find that I’d rather run 3x Dire Fleet Daredevil for the first strike and spell interaction. If you look at my maybeboard, you’ll see I’ve been considering these cards. I recommend you run this deck. It’s cheap to build and it’s actually pretty good! Just remember to mainboard the Duresses if your meta has a ton of control like mine. 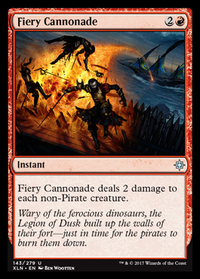 Otherwise, use Fiery Cannonade on the mainboard to blow out aggro, weenies, and tokens in Game 1! Thanks for checking out the deck. If you do end up running your own version, please do reach out to me about your build and its results! I’m sure that my list could be improved upon, and maybe it does need to be running the cards you’ve suggested! This deck looks sweet. I feel like both Dire Fleet Captain and Captain Lannery Storm could probably go in but I'm not sure what to take out except for maybe Fathom Fleet Captain. I'm currently running Mono red Experimental Frenzy but I've been considering switching over to a Rakdos build depending on what shows up in Allegiance and this could be a cool deck to check out in the wait for that. 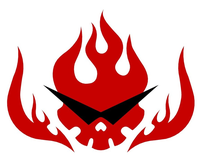 As for Warkite Marauder, I've definitely been thinking about it! Warkite is an option but when I was making this deck I decided that Fathom Fleet Captain and Dire Fleet Poisoner was a way more dangerous combination. The Captain's ability to create tokens is my ideal win condition and usually my opponent is really focused on killing it off with dual blockers. Against something like Green Stompy, there's a good chance my Captain will eventually be blocked and not even manage to kill something in the trade. Dire Fleet Poisoner gives Fathom Fleet Captain the chance to create a 2/2 Menace Token AND kill two creatures at the same time with death touch. It makes the Captain way more intimidating than it already is. Plus, the Poisoner is really versatile since I can surprise flash it in on my opponent's turn as a blocker or just bring it in on their turn to avoid summoning sickness. As for Becket Brass, she's definitely always in the back of my mind but I'm not ambitious enough to try a 3 color formula quite yet. Thanks for all your thoughts. I actually may decide to swap out at least one Kitesail Freebooter with a Warkite Marauder. Time will tell. Red_X on Pirates of the Budget Builds Trading Co.
Orion93 I kind of joined these guys and don't want to impose any other formats on them ;) For now it will have to be exclusively standard, but aggro pirates are lots of fun, so I don't mind. I am putting some Fell Flagships to boost my defensive abilities, the deck in its current form lacks in defense, and I need that sometimes. Fathom Fleet Captain turns out to be really useful in casual play, I can keep creatures on hand and spend mana on tokens, and menace seems to grind my opponent's gears.